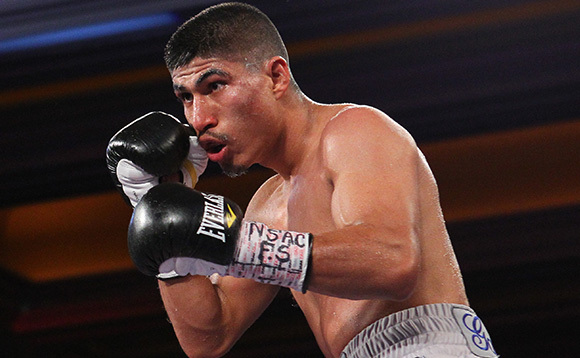 Mikey Garcia captured a world title in his fourth weight division, outpointing previously undefeated Sergey Lipinets to win the IBF Junior Welterweight World Championship Saturday on SHOWTIME from Freeman Coliseum in San Antonio. Garcia, who was fighting for just the second time at 140 pounds, relied on a steady diet of combos to back up Lipinets, who was making the first defense of the IBF title he won last November on SHOWTIME. Garcia floored Lipinets for the first time in his career, connecting on a counter left hook midway through the seventh in a rousing moment that sent the pro-Garcia crowd at Freeman Coliseum to their feet. Despite being the defending champion, Lipinets (13-1, 10 KOs) was fighting in just his 14th professional fight. The Russian, who was born in Kazakhstan, delivered a valiant effort against one of the best pound-for-pound fighters in the world. In the opening bout of the SHO EXTREME telecast, Richard Commey (26-2, 23 KOs) scored a sixth-round TKO of Alejandro Luna (22-1, 15 KOs) in their IBF Lightweight World Title Eliminator. The fight was defined by exciting exchanges throughout, with Commey, fighting on his 31st birthday, getting the better early and connecting with power punches that caused Luna’s jaw to swell. Commey’s power broke through in round six when a powerful combination punctuated by a left uppercut sent Luna to the canvas for the first time in his career.